Jacob Ludwig Karl Grimm (4 January 1785 – 20 September 1863), also known as Ludwig Karl, was a German philologist, jurist, and mythologist. He is known as the discoverer of Grimm's law (linguistics), the co-author of the monumental Deutsches Wörterbuch, the author of Deutsche Mythologie, and the editor of Grimm's Fairy Tales. He is the elder of the Brothers Grimm. Jacob Grimm was born in Hanau in Hesse-Kassel. His father Philipp Grimm was a lawyer who died while Jacob was a child, and his mother was left with very small means. His mother's sister was lady of the chamber to the Landgravine of Hesse, and she helped to support and educate her family. Jacob was sent to the public school at Kassel in 1798 with his younger brother Wilhelm. In 1802, he went to the University of Marburg where he studied law, a profession for which he had been destined by his father. His brother joined him at Marburg a year later, having just recovered from a severe illness, and likewise began the study of law. Up to this time, Jacob Grimm had been driven only by a general thirst for knowledge, and his energies had not found any aim beyond the practical one of making himself a position in life. 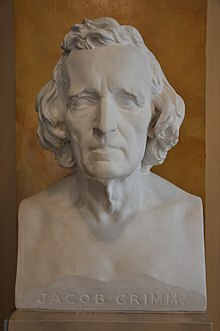 The first definite impulse came from the lectures of Friedrich Karl von Savigny, the celebrated investigator of Roman law, who first taught him to realize what it meant to study any science, as Wilhelm Grimm himself says in the preface to the Deutsche Grammatik (German Grammar). Savigny's lectures also awakened in him a love for historical and antiquarian investigation, which forms the structure of all his work. The two men became personally acquainted, and it was in Savigny's well-stocked library that Grimm first turned over the leaves of Bodmer's edition of the Middle High German minnesingers and other early texts, and felt an eager desire to penetrate further into the obscurities and half-revealed mysteries of their language. In the beginning of 1805, he received an invitation from Savigny, who had moved to Paris, to help him in his literary work. Grimm passed a very happy time in Paris, strengthening his taste for the literatures of the Middle Ages by his studies in the Paris libraries. Towards the close of the year, he returned to Kassel, where his mother and Wilhelm had settled, the latter having finished his studies. The next year, he obtained a position in the war office with the very small salary of 100 thalers. One of his grievances was that he had to exchange his stylish Paris suit for a stiff uniform and pigtail. But he had full leisure for the pursuit of his studies. In 1808, soon after the death of his mother, he was appointed superintendent of the private library of Jérôme Bonaparte, King of Westphalia, into which Hesse-Kassel had been incorporated by Napoleon. Bonaparte appointed him an auditor to the state council, while Grimm retained his superintendent post. His salary was increased in a short period of time from 2000 to 4000 francs and his official duties were hardly more than nominal. After the expulsion of Bonaparte and the reinstatement of an elector, Grimm was appointed Secretary of Legation in 1813, accompanying the Hessian minister to the headquarters of the allied army. In 1814, he was sent to Paris to demand restitution of books carried off by the French, and he also attended the Congress of Vienna as Secretary of Legation, 1814–1815. Upon his return from Vienna, he was sent to Paris a second time to secure book restitutions. Meanwhile, Wilhelm had received an appointment to the Kassel library, and Jacob was made second librarian under Volkel in 1816. Upon the death of Volkel in 1828, the brothers expected to be advanced to the first and second librarianships respectively, and were dissatisfied when the first place was given to Rommel, the keeper of the archives. Consequently, they moved the following year to Göttingen, where Jacob received the appointment of professor and librarian, and Wilhelm that of under-librarian. Jacob Grimm lectured on legal antiquities, historical grammar, literary history, and diplomatics, explained Old German poems, and commented on the Germania of Tacitus. Grimm joined other academics known as the Göttingen Seven who signed a protest against the King of Hanover's abrogation of the constitution which had been established some years before. As a result, he was dismissed from his professorship and banished from the Kingdom of Hanover in 1837. He returned to Kassel with his brother, who had also signed the protest. They remained there until 1840, when they accepted King Frederick William IV's invitation to move to Berlin, where they both received professorships and were elected members of the Academy of Sciences. Grimm was not under any obligation to lecture and he seldom did so, but spent his time working with his brother on their great dictionary. During their time in Kassel, he regularly attended the meetings of the academy and read papers on varied subjects. The best-known of those subjects are Karl Konrad Friedrich Wilhelm Lachmann, Friedrich Schiller, old age, and the origin of language. He also described his impressions of Italian and Scandinavian travel, interspersing his more general observations with linguistic details, as is the case in all his works. He was elected a Foreign Honorary Member of the American Academy of Arts and Sciences in 1857. Nearly all my labors have been devoted, either directly or indirectly, to the investigation of our earlier language, poetry and laws. These studies may have appeared to many, and may still appear, useless; to me they have always seemed a noble and earnest task, definitely and inseparably connected with our common fatherland, and calculated to foster the love of it. My principle has always been in these investigations to under-value nothing, but to utilize the small for the illustration of the great, the popular tradition for the elucidation of the written monuments. Grimm's Geschichte der deutschen Sprache (History of the German Language) explores German history hidden in the words of the German language and is the oldest natural history of the Teutonic tribes determined by means of language. He collected scattered words and allusions found in classical literature and endeavoured to determine the relationship between the German language and those of the Getae, Thracians, Scythians, and many other nations whose languages were known only through Greek and Latin authors. Grimm's results have been greatly modified by the wider range of comparison and improved methods of investigation that now characterize linguistics. Many questions that he raised remain obscure due to the lack of surviving records of the languages, but his book's influence has been profound. Grimm's famous Deutsche Grammatik (German Grammar) was the outcome of his purely philological work. The labors of past generations from the humanists onwards resulted in an enormous collection of materials in the form of text editions, dictionaries, and grammars, although most of it was uncritical and unreliable. Some work had even been done in the way of comparison and determination of general laws, and the concept of a comparative Germanic grammar had been clearly grasped by the illustrious Englishman George Hickes by the beginning of the 18th century in his Thesaurus. Ten Kate in the Netherlands had [afterwards] (after Grimm's book?) made valuable contributions to the history and comparison of Germanic languages. Even Grimm himself did not initially intend to include all the languages in his Grammar, but he soon found that Old High German postulated Gothic, and that the later stages of German could not be understood without the help of other West Germanic varieties including English, and that the rich literature of Scandinavia could likewise not be ignored. The first edition of the first part of the Grammar, which appeared in 1819 treated the inflections of all these languages. It included a general introduction in which he vindicated the importance of an historical study of the German language against the a priori, quasi-philosophical methods then in vogue. In 1822 this same volume appeared in a second edition (really a new work, for, as Grimm himself says in the preface, it cost him little reflection to "mow the first crop down to the ground"). The considerable gap between the two stages of Grimm's development of these two editions is significantly shown by the fact that, while the first edition gives only the inflections, the second volume addresses phonology with no fewer than 600 pages – more than half of the volume. Grimm had, at last, awakened to the full conviction that all philology must be based on rigorous adherence to the laws of sound change in order to be sound, and he subsequently never deviated from this principle. This gave to all his investigations, even in their boldest flights, an iron-bound consistency, and a force of conviction that distinguishes science from dilettantism. Prior to Grimm's time, philology was nothing than laborious and conscientious dilettantism, with occasional instances of scientific inspiration. His advances must be attributed mainly to the influence of his contemporary Rasmus Christian Rask. Rask was born two years later than Grimm, but his remarkable precocity set him beyond his years. In Grimm's first editions, his Icelandic paradigms are based entirely on Rask's grammar, and in his second edition, he relied almost entirely on Rask for Old English. His debt to Rask can be appreciated only by comparing his treatment of Old English in the two editions; the difference is very great. For example, in the first edition he declines dæg, dæges, plural dægas, without having observed the law of vowel-change pointed out by Rask. (The correct plural is dagas.) There can be little doubt that the appearance of Rask's Old English grammar was the primary impetus for Grimm to recast his work from the beginning. To Rask also belongs the merit of having first distinctly formulated the laws of sound-correspondence in the different languages, especially in the vowels (those more fleeting elements of speech previously ignored by etymologists). The Grammar was continued in three volumes, treating principally derivation, composition and syntax, the last of which was unfinished. Grimm then began a third edition, of which only one part, comprising the vowels, appeared in 1840, his time being afterwards taken up mainly by the dictionary. The Grammar stands alone in the annals of science for its comprehensiveness, method and fullness of detail. Every law, every letter, every syllable of inflection in the different languages was illustrated by an almost exhaustive mass of material, and it has served as a model for all succeeding investigators. Diez's grammar of the Romance languages is founded entirely on its methods, which have also exerted a profound influence on the wider study of the Indo-European languages in general. Jacob is recognized for enunciating Grimm's law, the Germanic Sound Shift, which was first observed by the Danish philologist Rasmus Christian Rask. Grimm's law was the first non-trivial systematic sound change to be discovered. Grimm's law, also known as the 'Rask-Grimm Rule' or the First Germanic Sound Shift, was the first law in linguistics concerning a non-trivial sound change. It was a turning point in the development of linguistics, allowing the introduction of a rigorous methodology to historic linguistic research. It concerns the correspondence of consonants between the ancestral Proto-Indo-European language and its Germanic descendants, Low Saxon and High German, and was first fully stated by Grimm in the second edition of the first part of his Grammar. The correspondence of single consonants had been more or less clearly recognized by several of his predecessors, including Friedrich von Schlegel, Rasmus Christian Rask and Johan Ihre, the last having established a considerable number of literarum permutationes, such as b for f, with the examples bœra = ferre ("to bear"), befwer = fibra ("fiber"). Rask, in his essay on the origin of the Icelandic language, gave the same comparisons, with a few additions and corrections, and even the same examples in most cases. As Grimm in the preface to his first edition expressly mentioned Rask's essay, there is every probability that it inspired his own investigations. But there is a wide difference between the isolated permutations described by his predecessors and his own comprehensive generalizations. The extension of the law to High German in any case is entirely Grimm's work. The only fact that can be adduced in support of the assertion that Grimm wished to deprive Rask of his claims to priority is that he does not expressly mention Rask's results in his second edition. But it was part of the plan of his work to refrain from all controversy or reference to the works of others. In his first edition, he expressly calls attention to Rask's essay, and praises it ungrudgingly. It is true that a certain bitterness of feeling afterwards sprang up between Grimm and Rask, but this may have well been Rask's fault, who, impatient of contradiction and irritable in controversy, refused to consider the value of Grimm's views when they called for the modification of his own. Grimm's monumental dictionary of the German Language, the Deutsches Wörterbuch, was started in 1838 and first published in 1854. The Brothers anticipated it would take 10 years and encompass some 6–7 volumes. However, it was undertaken on so large a scale as to make it impossible for them to complete it. The dictionary, as far as it was worked on by Grimm himself, has been described as a collection of disconnected antiquarian essays of high value. It was finally finished by subsequent scholars in 1961 and supplemented in 1971. At 33 volumes at some 330,000 headwords, it remains a standard work of reference to the present day. A current project at the Berlin-Brandenburg Academy of Sciences and Humanities is underway to update the Deutsches Wörterbuch to modern academic standards. Volumes A–F were scheduled for release in 2012. The first work Jacob Grimm published, Über den altdeutschen Meistergesang (1811), was of a purely literary character. Yet even in this essay Grimm showed that Minnesang and Meistergesang were really one form of poetry, of which they merely represented different stages of development, and also announced his important discovery of the invariable division of the Lied into three strophic parts. Grimm's text-editions were mostly prepared in conjunction with his brother. In 1812 they published the two ancient fragments of the Hildebrandslied and the Weißenbrunner Gebet, Jacob having discovered what till then had never been suspected — namely the alliteration in these poems. However, Jacob had little taste for text editing, and, as he himself confessed, working on a critical text gave him little pleasure. He therefore left this department to others, especially Lachmann, who soon turned his brilliant critical genius, trained in the severe school of classical philology, to Old and Middle High German poetry and metre. The first edition of his Deutsche Mythologie (German Mythology) appeared in 1835. This great work covered the whole range of the subject, attempting to trace the mythology and superstitions of the old Teutons back to the very dawn of direct evidence, and following their evolution to modern-day popular traditions, tales, and expressions. Grimm's work as a jurist was influential for the development of the history of law, particularly in Northern Europe. His essay Von der Poesie im Recht (Poetry in Law, 1816) developed a far-reaching, suprapositivist Romantic conception of law. The Deutsche Rechtsalterthümer (German Legal Antiquities, 1828) was a comprehensive compilation of sources of law from all Germanic languages, whose structure allowed an initial understanding of older German legal traditions not influenced by Roman law. Grimm's Weisthümer (4 vol., 1840–63), a compilation of partially oral legal traditions from rural Germany, allows research of the development of written law in Northern Europe. Jacob Grimm's work tied in strongly to his views on Germany and its culture. His work with fairy tales and his philological work dealt with German origins. He loved his people and wished for a united Germany, he and his brother were vocal proponents of expansionist Pan-Germanism. In the German revolution of 1848, he was given a chance to make these views known when he was elected to the Frankfurt National Parliament. The people of Germany had demanded a constitution, so the Parliament, formed of elected members from various German states, met to form one. Grimm was selected for the office in a large part because of his part in the University of Goettingen's refusal to swear to the king of Hanover expounded upon above. He then went to Frankfurt, where he did not play a big part, but did make some speeches, which tended to stray into the realms of history and philology rather than whatever political question was at hand. Grimm was adamant on one subject, however; he wanted the Danish-ruled but German-speaking duchy of Holstein to be under German control. He talked passionately on this subject, which showed his fierce German nationalism. Grimm was not made to be a politician, and also soon realized that the National Assembly was not getting anywhere (it was eventually dissolved without establishing a constitution), and so asked to be released from his duties and returned with relief to his former studies. His political career did not bloom into anything great, but it does illustrate his characteristics—his nationalism and his moralism. He believed that good would triumph in the Parliament, and pushed for human rights legislation just as he wished for a unified Germany. The following is a complete list of Grimm's separately published works. Those he published with his brother are marked with a star (*). For a list of his essays in periodicals, etc., see vol. V of his Kleinere Schriften, from which the present list is taken. His life is best studied in his own Selbstbiographie, in vol. I of the Kleinere Schriften. There is also a brief memoir by Karl Goedeke in Göttinger Professoren (Gotha (Perthes), 1872). ^ a b c d e f g h i j k l m n o p q r s One or more of the preceding sentences incorporates text from a publication now in the public domain: Chisholm, Hugh, ed. (1911). "Grimm, Jacob Ludwig Carl" . Encyclopædia Britannica (11th ed.). Cambridge University Press. ^ "Book of Members, 1780–2010: Chapter G" (PDF). American Academy of Arts and Sciences. Retrieved 9 September 2016. ^ Dilcher, Gerhard (2001). "Grimm, Jakob". In Michael Stolleis. Juristen: ein biographisches Lexikon; von der Antike bis zum 20. Jahrhundert (in German) (2nd ed.). München: Beck. p. 262. ISBN 3-406-45957-9. ^ "Obituary. ; DEATH OF JACOB GRIMM". The New York Times. 1863-10-09. ISSN 0362-4331. Retrieved 2019-03-06. ^ "Jacob Grimm". Biography. Retrieved 2019-03-06. Wikimedia Commons has media related to Jacob Grimm. Teutonic Mythology, English translation of Grimm's Deutsche Mythologie (1880). Grimm, 2) Jakob Ludwig Karl. article in: Meyers Konversations-Lexikon, 4. Aufl. 1888–1890, Bd. 7, S. 741 f.